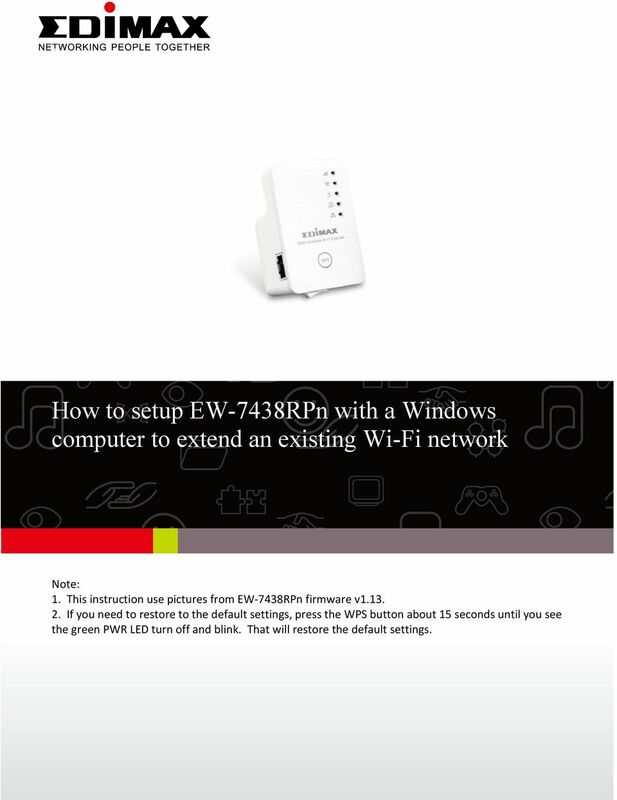 Download "How to setup EW-7438RPn with a Windows computer to extend an existing Wi-Fi network"
1 2 How to setup EW-7438RPn with a Windows computer to extend an existing Wi-Fi network Note: 1. This instruction use pictures from EW-7438RPn firmware v If you need to restore to the default settings, press the WPS button about 15 seconds until you see the green PWR LED turn off and blink. That will restore the default settings. 2 Hardware Install: 1. Plug the EW-7438RPn extender into a power outlet close to the root wireless access point and switch it on (1). 2. Get an Ethernet cable to connect your computer to the Ethernet port of EW-7438RPn. 3. 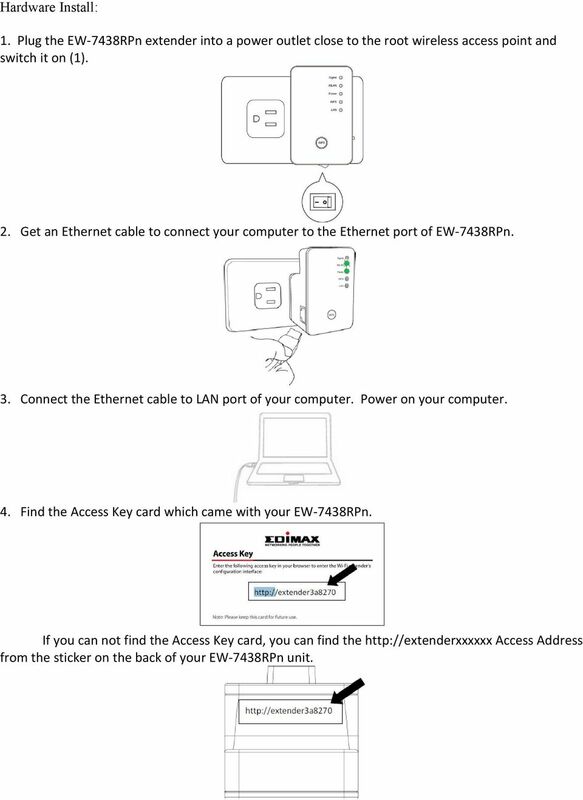 Connect the Ethernet cable to LAN port of your computer. Power on your computer. 4. Find the Access Key card which came with your EW-7438RPn. If you can not find the Access Key card, you can find the Access Address from the sticker on the back of your EW-7438RPn unit. 3 5. Observe the LED on the extender. The power LED ( ) will be steady on. The Wi-Fi LED ( ) will begin to flash rapidly. This indicates initialization is complete. Please do not proceed to next step until these conditions are fulfilled. 4 Setup Procedure: 1. Open any of your preferred web browsers. It can be Internet Explorer, Firefox, or Google Chrome. It is normal that you don t have Internet because the extender does not connect to Internet yet. 2. Type in the Access Key like into the Address box. Hit the Enter key. The prompt window asks you enter the login username and password. If the address does not work for you, please use then hit the Enter key. Our default username is admin, password is Click on OK or Login. 3. You will enter into our iqsetup Wizard. All detected Wi-Fi network will be displayed in the list. 5 Note: If the Wi-Fi network you wish to connect to does not appear, click Refresh to detect again or try to move the extender closer to the root wireless access point. 4. Select your Wi-Fi network you wish our extender to connect to. Two lines show up for Device SSID and KEY. The Device SSID will be the network name of the range extender. By default, it uses the network name of your Wi-Fi network and adds 6 characters from the extender s address. You can change the Device SSID to some other preferred extender name. Input the wireless security password of your existing Wi-Fi network in the Key field. 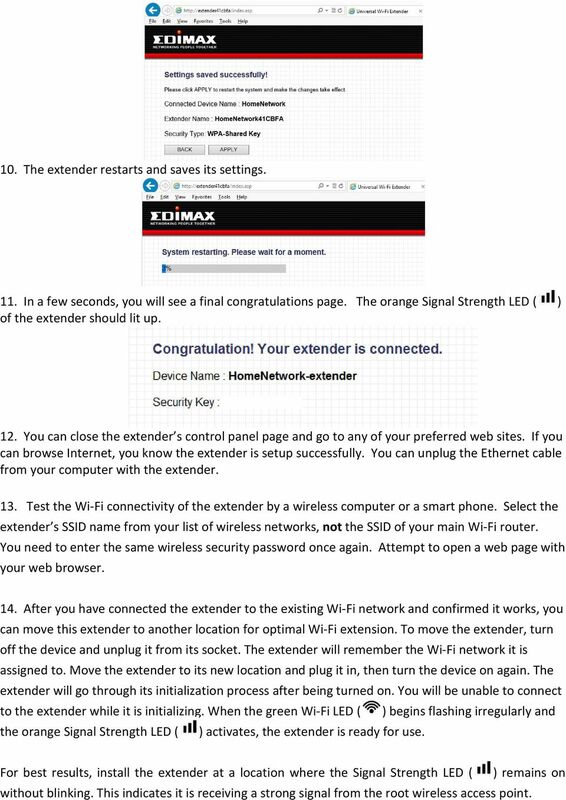 The extender must have the same Wi-Fi password used in your main Wi-Fi network. Note: The wireless security password is case sensitive. 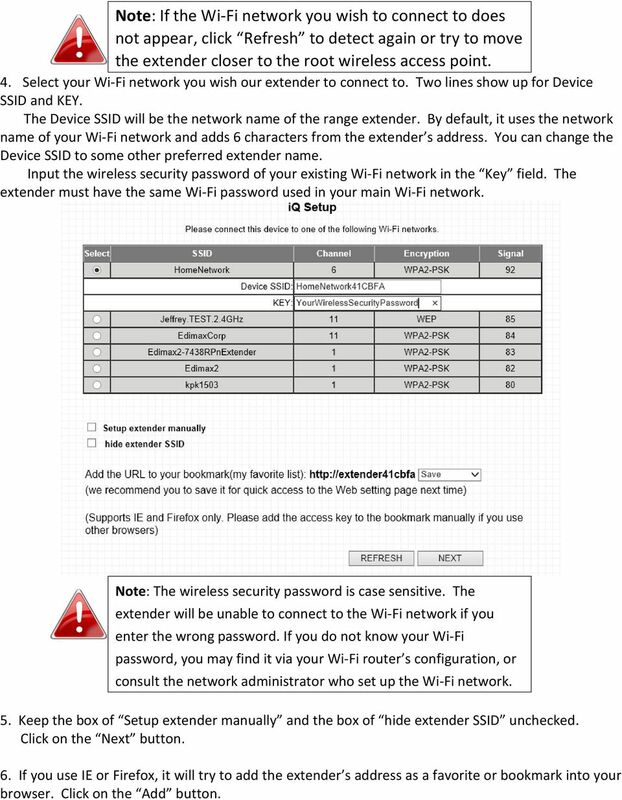 The extender will be unable to connect to the Wi-Fi network if you enter the wrong password. If you do not know your Wi-Fi password, you may find it via your Wi-Fi router s configuration, or consult the network administrator who set up the Wi-Fi network. 5. Keep the box of Setup extender manually and the box of hide extender SSID unchecked. Click on the Next button. 6. 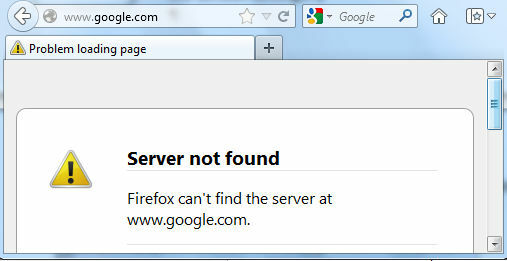 If you use IE or Firefox, it will try to add the extender s address as a favorite or bookmark into your browser. Click on the Add button. 6 7. 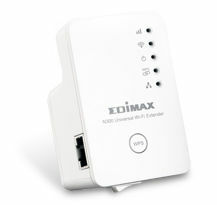 The extender will test the connection between the device and your main WiFi router. 8. If the connection test is successful, the message Connection Test Successfully will appear onscreen. Click Next to the next page. 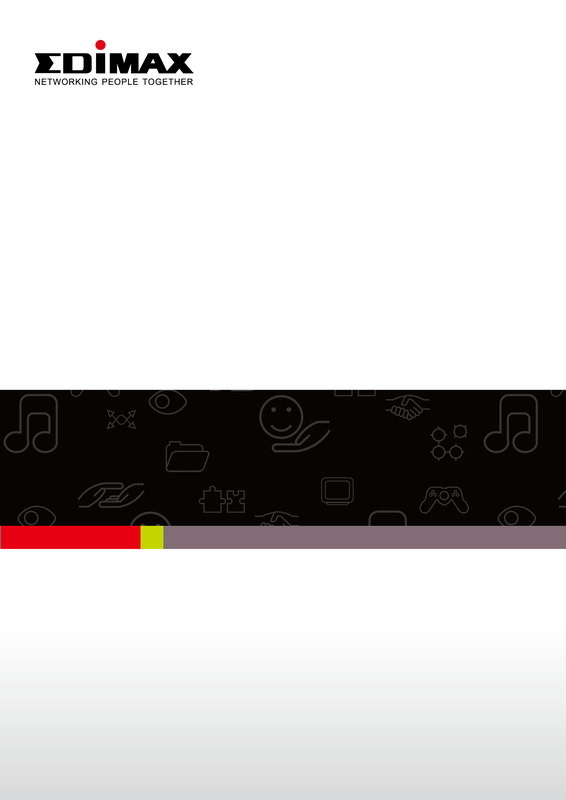 If the connection test failed, the message Connection Test Failed will appear on-screen. Click BACK to restart the setup process. Make sure you enter the correct wireless security password. 9. 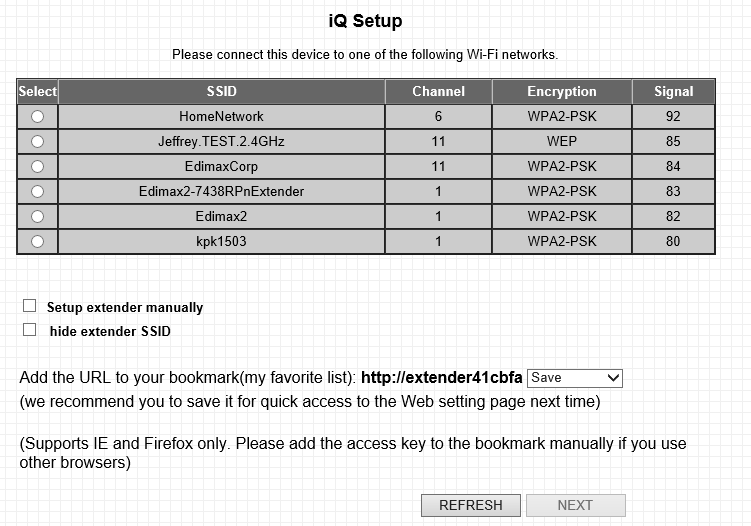 After you click on Next, it displays a summary of the connected device which is the main Wi-Fi router and the extender s network name. Click on Apply button. 7 10. The extender restarts and saves its settings. 11. In a few seconds, you will see a final congratulations page. The orange Signal Strength LED ( ) of the extender should lit up. 12. You can close the extender s control panel page and go to any of your preferred web sites. If you can browse Internet, you know the extender is setup successfully. You can unplug the Ethernet cable from your computer with the extender. 13. Test the Wi-Fi connectivity of the extender by a wireless computer or a smart phone. Select the extender s SSID name from your list of wireless networks, not the SSID of your main Wi-Fi router. 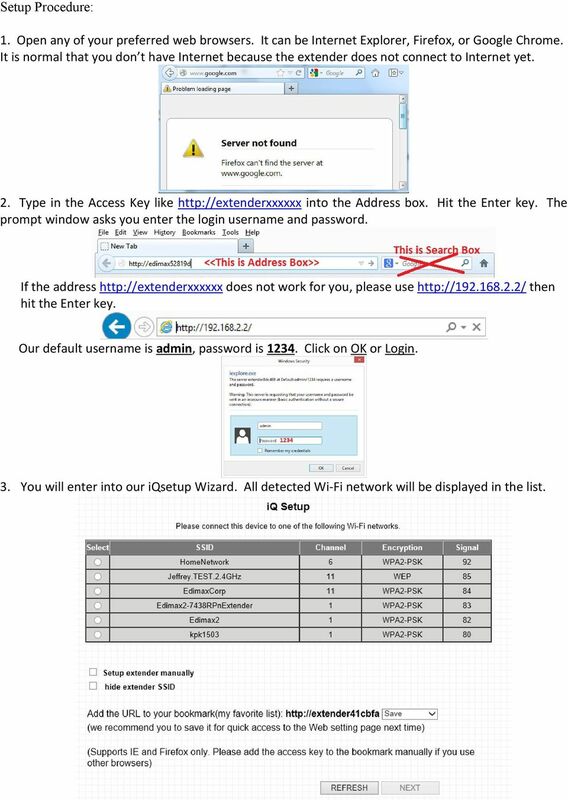 You need to enter the same wireless security password once again. Attempt to open a web page with your web browser. 14. After you have connected the extender to the existing Wi-Fi network and confirmed it works, you can move this extender to another location for optimal Wi-Fi extension. To move the extender, turn off the device and unplug it from its socket. The extender will remember the Wi-Fi network it is assigned to. Move the extender to its new location and plug it in, then turn the device on again. The extender will go through its initialization process after being turned on. You will be unable to connect to the extender while it is initializing. When the green Wi-Fi LED ( ) begins flashing irregularly and the orange Signal Strength LED ( ) activates, the extender is ready for use. For best results, install the extender at a location where the Signal Strength LED ( ) remains on without blinking. This indicates it is receiving a strong signal from the root wireless access point. Using your ios device, open the App Store, Search for, download and install the WeMo App. 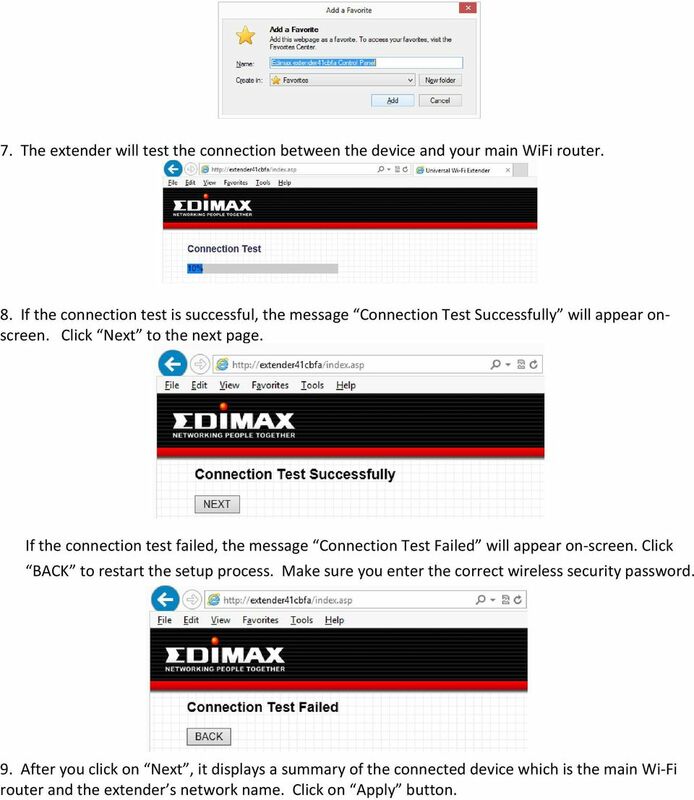 300Mbps Wireless LAN Repeater Quick Start Guide Version:MZK-EX300N_QIG-A_V1.1 In order to guarantee the correct usage of our products, this guide gives instructions on how to set and use our products. OvisLink OV804WVA Quick Installation Guide 1 Indicators and Interfaces 1.1 Front Panel LED Color Status Description Power Red DSL Internet Red WAN LAN4-1 Off Power off. The initialization is normal. Initiating. 1. Open your Internet Browser and enter http://192.168.1.254. 2. You will be prompted to enter a username and password. Quick Installation Guide Live! Titanium Contents 1. Live! overview... 2. Installation... 3. Network setup... 4. Wireless setup... 5. Configuring your Live!... 6. Troubleshooting... 2 4 7 8 9 10 1 1. Live!